Never heard of Factor Equipment? Don’t worry, neither had we. The brand emerged last year as a purveyor of higher-end flashlights and knives catering to everyday users, first responders, law enforcement, and other situations where “junk gear is not an option”. So, with our interest piqued we got our hands on one of their early models – the Factor Absolute. Based in Springdale, Arkansas, the brand was started in 2016 by Bryan Griggs, a former VP from 5.11 Tactical, and started out selling tactical flashlights though it appears their focus is shifting towards knife development and other EDC items. Despite their US-based head office, note that Factor’s products are produced in China and Taiwan. As someone with a deep seated love for well-established purveyors of high end gear (Spyderco, Benchmade, Leatherman, KAI, etc. ), Factor starting out their mission statement with the sentence “Factor Equipment was spawned from years of frustration and lack of trust in the brands on the market” is certainly a suitably bold decision. This is made more complicated by accusations that the design for their Iconic folder was a copy of the Voxnaes-penned Giant Mouse GM1 which arose during an early Massdrop of the Factor knife, which was subsequently cancelled. Intellectual property is sacrosanct in the knife market, with far more of an emphasis placed on its importance than most things, so this didn’t go over well at all. The Iconic has since been pulled from most retailers and we understand it’s being removed from Factor’s lineup. Thankfully, no such intellectual property issue surrounds the Absolute, which is a more interesting design anyway. Most brands on the market have earned the trust of consumers over years of hard work. What’s Factor got to offer the enthusiast? Well, as far as a company goes: more questions than answers. As far as products go: a pretty good start. The Absolute comes in two sizes, the Absolute One (reviewed here) and the Absolute Compact, with a quarter inch less blade. As with many new products these days, the Absolute follows a popular formula: it’s a titanium handled framelock equipped with a flipper and a ball-bearing pivot for a snappy action. There are some unique details to make it stand out from the crowd of otherwise similar slab handled titanium flippers that have flooded the market. With a medium sized blade and some details that lend more towards showy than useful, the Absolute is aimed at the EDC market rather than the hard-use market, despite the high end blade steel and stout lock. Let’s take a look at Factor’s premium offering and see if it lives up to all the bluster and promise of the fledgling brand. Mmm… Bohler M390. Interested? Right off the bat, the Absolute brings one of the highest-performing stainless steels on the market to the table. A modern powdered metallurgy steel, M390 has high chromium and vanadium content, making it very fine-grained (to get a super clean edge) and extremely corrosion resistant. Carbon content is also relatively high, the primary factor of a steel’s edge retention and hardness. Short of freak pseudo-steels like CPM-S110V or Maxamet, M390 is one of the longest edge-holding steels you can get your hands on that a human can still sharpen. The blade itself measures 3.15” with a 0.14” thick spine. The Absolute uses modified drop-point blade shape with an attractive recurve to the spine and a shallow belly, while a high flat grind terminating right below the thumb “hole” drops down to leave a shallow ricasso with a small but complete sharpening choil. The modified drop point shape of the blade leaves the tip below the center axis of the handle, providing the user additional leverage for piercing cuts and detail work – which is helped by the fact that the Absolute has a fantastic tip, perfect for popping open stubborn packaging and ninja-slicing open letters to the chagrin of your spouse. A thumb hole – more of a misshapen oval, actually – sits up high on the blade, and a short run of jimping on the spine lines up with the same on the handle when open to give a positive grip. The blade has a smooth and subtle stonewash finish, and a short triangular shaped flipper tab. From the pointy end of things, the Absolute is a gem for EDC purposes: the mid-sized blade is in the sweet spot between usability and unwieldiness, the drop point blade shape and needle like tip are useful for daily tasks, and the blade steel is one of the best in the business. So far so good. The Absolute One should be a superlative flipper, but I’m still left somewhat cold after daily carrying it and flipping it obsessively for a few weeks. It features all of the things that a modern high end knife should: a lightswitch style flipper formed from a right triangle protruding from the spine level with the pivot, with a bit of jimping for traction. The pivot is ceramic ball bearings with what looks like phosphor bronze washers to prevent galling of the titanium (as the hardness of titanium is usually considerably lower than steel or ceramic). A stainless lockbar insert is hidden in the lock bar to help prevent lock stick. But despite the impressive “spec sheet”, the Absolute is a stubborn flipper. Out of the box it’s overly tight, given a slightly gritty feel and entirely too strong of a detent for casual users. Once you overcome the monster detent it opens up reliably – which it would be surprising if it didn’t, with how much force it requires. Engagement is appropriate for a long lifespan, somewhere around 30% when flipped open hard, and out of the box there’s no blade play vertically or horizontally. Closing the knife doesn’t give much of an indication that it even has bearings – past the detent when closing and it takes a firm shake to get the blade to gradually drop down into the handle, hardly the free-dropping magic of something like a ZT with KVT bearings or the Buck Marksman, my highwater mark for “low friction bearing flippers.” It seems as though the Absolute has all the complexity of a bearing pivot but none of the advantages. Also irritatingly, while the Absolute features a very unique looking thumb hole, it is absolutely unusable – no matter how much you loosen the pivot screw to back off the detent ball, it’s impossible to open the knife using the thumb hole from either the front or the back of the blade. Unlike some flippers which have “thumb studs” which are actually an external stop pin, the thumb hole on the Absolute serves no purpose at all. Why include it if you can’t even use it? In my eyes, anything that limits use options on a knife is a demerit, and I think the knife would look better without the thumb hole considering it can’t be used. As soon as you begin fiddling with the pivot in order to loosen the Absolute up enough to where it flips like it should, (i.e., like a modern bearing pivot flipper) even incremental changes are met with noticeable side to side blade play. This is confusing considering the “bushing” nature of bearing pivots which in theory allows a much wider range of adjustment before tactile play comes into the equation. Once loosened up about a quarter of a turn from fully tight the Absolute flips better, with the detent becoming a bit softer and the blade dropping closed noticeably easier, if not fully free-dropping. It’s just that you can’t attain this flipping perfection with all of the side to side blade play dialed out. For a knife with a $230 MSRP this doesn’t pass muster in my eyes. I found myself frequently saying “this is the first knife this company has made?” with both a sense of incredulity and disappointment. There is good and there is bad in nearly equal measure. Features? Oh, this baby is loaded up with them. Beyond the ultra-premium blade (which I am a fan of), the Absolute packs all the trappings of a modern high end flipper. The titanium handles are slab sided with slight contouring to the edges for a more comfortable grip. There is a groove cut into the handle diagonally from the spine to behind the thumb indentation (for the thumb hole that doesn’t work…). A stainless steel insert is bolted to the inside of the lockbar to eliminate stick. It also serves as an overtravel stop, with a tab hitting the inside of the lock side scale when opened to prevent metal fatigue. Strangely, the Absolute features a lanyard hole shaped like a ¼” hex bit driver, but is actually a 5mm hex slot, of which I’m unaware of the existence of any bits to fit. Mounted next to that is another controversial feature – a 3D machined titanium pocket clip that is configured for right-hand-tip-up carry only. A very thin bridge between the standoff and the point of contact means very little spring tension, which they counteract with a sharply pointed cone for a contact patch on the other end. It does the job, holding the knife in your pocket without sliding out or doing the “pocket pendulum” but it does a remarkable job of shredding denim and running into things. I realize that machined pocket clips are expected at this price point and they’re a calling card for what a company can achieve with a CNC machine, but the truth is that you can accomplish more for less – weight, cost, and size – with a stamped steel or even a stamped titanium pocket clip. From a pocket candy perspective, it’s attractive and a cool talking point – but from an EDC standpoint, which is what the Absolute is intended for, I’m not a fan. The Absolute comes packaged in a padded zipper pouch which includes a lint-free cleaning cloth, a plastic sleeve, and a small stamped steel multitool with a set of stepped wrenches, two small flathead screwdrivers, the ubiquitous bottle opener, and fittings to adjust the pivot. Oh jeez, here it is: Can we stop the proprietary fittings train? I’d like to get off. The Absolute has proprietary fittings all over it, one size for the pivot and another size for the body screws, with Torx screws securing the pocket clip as well as the lockbar stabilizer. I appreciate that they include a tool to adjust the pivot with the knife (some manufacturers seem to use proprietary hardware for the sole purpose of making more money forcing you to buy the tool) but the tool does not include the miniature fittings for the body screws. Using the tool to adjust the pivot tension is a far more annoying process than it would be if the Absolute used a Torx T10 fitting like most other quality knives. Luckily the pivot screw isn’t secured into the barrel with Loctite, since the barrel isn’t located to the scales with an inset hex head or d-shaped fitting so it tends to want to spin when you loosen the pivot screw – which wouldn’t be a problem if the fittings weren’t proprietary on both sides, but the knife only comes with one tool. Another annoyance is that the adjustment tool fits into the pivot parallel to the handle rather than perpendicular like a Torx bit would, so you have to exercise caution not to scrape the handles with the tool itself. This is made difficult by the shallow engagement the tool has with the grooves in the pivot, and inevitably ends up slipping out and making small scratches on the handle – which can be irritating depending on how deep your OCD runs. The smaller of the two included straight drivers will fit into one slot on the body screws (each screw has three slots arranged radially) but there’s not enough grip to overcome how tight they are, and after a few attempts I gave up for fear of damaging the hardware. I suppose it’s not Factor’s intention that you disassemble their knives, hinted at by the wording of their warranty that excludes “repairs to your knife performed by any other source” but being able to break down the Absolute for maintenance and cleaning would be nice. Proprietary hardware seems like adding fancy stuff for the sake of being fancy, not for the sake of being better. Heat treated torx screws can be very good looking (look at the flush mount torx screws on a PM2!) and are usable. Let’s talk about the branding on the handle for a bit, though. The Absolute has “F A C T O R” machined below the lanyard hole on the show side of the handle in fairly large letters in proportion to the size of the handle. It’s not that it’s an ugly logo, or that it makes the handle uncomfortable or really affects the knife in any functional way. It’s that it’s so painfully overt, and that’s not really something that works well with a high-end EDC item. Look at other successful high end knives: the Sebenza has a tiny little “CR” about the shape of a pencil eraser near the pivot on one side, and a very shallow “Idaho Made” engraved on the other. Spyderco etches the logo on the blade in front of the thumb hole opener, and some descriptive text on the tang (blade steel, place of origin, sometimes a designer logo). Even Zero Tolerance is more subtle about branding, and that may be the only thing you can say is subtle about a ZT at any point. People that carry high end EDC items aren’t looking for the sticker on the blade that says “SURGICAL STAINLESS STEEL” or an enormous brand stamp on the handle. Toning down the branding would make more sense here. The branding is even more egregious on Factor’s other product, the Iconic. As far as fit and finish goes, there really isn’t anything bad to say about the Absolute. It seems like a knife that has been put together and finished by people that care about what they’re doing. Grinds on the blade are perfectly even and the Absolute arrived scary sharp, able to push cut through card stock with ease. All of the intricate machining work on the spine lines up flawlessly, even where the jimping on the spine lines up with the jimping on the handle when open – a tough trick to accomplish considering all the moving parts and any potential variability from the stop pin. The stonewash on the blade is beautiful, smooth but with a shimmery three dimensional quality that smacks of attention to detail. It is strange that the stop pin is hidden but the screw securing the pocket clip isn’t, considering blind screws and 3D clips seem to go hand in hand these days. Blade centering is perfect, the backspacer lines up perfectly with the handle scales, and the grooves that run through both the scales and the backspacer all line up perfectly as well. Overall, a very well built knife with a mix of good and bad features. The Absolute works very well as its intended purpose of an EDC knife. It’s “just right” sized, weighing in at 4.3 ounces and around 4.5” long closed. A 3.15” blade is smaller than what I normally carry (my preferences normally are for something in the 3.5” range) but I’ve found that it has no trouble doing the vast majority of things I do every day while being easier to control than most knives. As far as ergonomics go, there aren’t any dramatic hot spots to speak of, with the machined pocket clip being hardly noticeable in hand. The Absolute lacks one of my favorite ergonomic features (a forward finger choil) but with a 3.15” blade you’d probably be looking at a 2.5” cutting edge or even less with a forward choil, so it’s not realistic. Grip is comfortable as you’d expect with an organic-shape handle, the curve of the spine towards the rear fitting naturally into the palm. The thumb indentation and the flipper tab together work as a finger guard to locate the front of your hand when open, and a short run of jimping on the underside of the handle towards the back lines up with your pinky finger. I’m not sure I understand the purpose of this jimping but it’s not uncomfortable and more traction is generally better. The Absolute cuts exceptionally well. I might prefer a hollow grind versus the flat grind here with the flats creating a narrow primary bevel, but the blade still slices quite well. The tip is needle sharp, able to pierce thick plastic packing with ease. There’s not really enough belly for rolling cuts for food prep, and the shape of the handle and the flipper tab when open isn’t conducive to this, but the upswept edge of the blade is good for cutting ropes and straps. As a general use knife, the blade shape is a good compromise between a straight edge and a curve for a variety of different tasks, and does most everything well and with good control. The steel holds an edge exceptionally well, which is the expectation for M390 – but what’s surprising is how stable the edge is considering the high hardness of the steel, being resistant to chipping when cutting nylon and cardboard more than other high end steels I’m used to. S110V holds an edge similarly well, but is far more prone to chipping when cutting mixed materials than M390, and is harder to touch up on a Sharpmaker. It’s an exceptional steel and it’s easy to see why people are so fond of it. The titanium handle is uncoated, and personally I love the way raw titanium wears in like a pair of your favorite jeans. Especially the edges of the clip which acquired a burnished appearance after a few weeks of carry. The smooth titanium feels nice in hand, too – a sensation familiar to fans of titanium folders. So the Absolute is a mix of joy and annoyance to use – it cuts great. It feels extremely nice in hand. It’s very well assembled and it’s easy to tell. But the detent is irritatingly stiff, the overt branding borders on the kind of embarrassment women face when buying an expensive purse (pay thousands of dollars to advertise for Louis Vuitton! 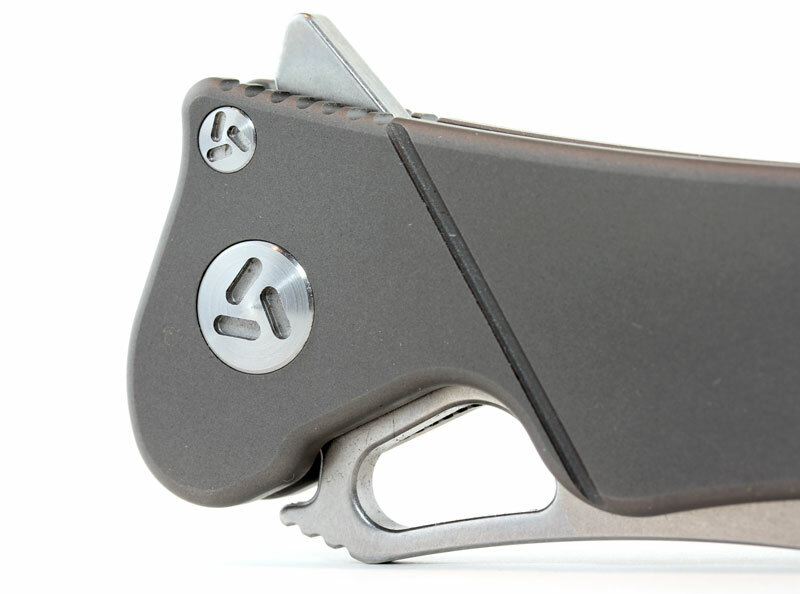 ), the action is not impressive, the pocket clip destroys your pocket, and so forth. These days, there is a plethora of alternatives in this market place. First off, if you want something slightly smaller, there’s the Absolute Compact with a 2.91” blade and a sub-three-ounce weight for a $215 MSRP. Kizer is quickly becoming a go to name for titanium flippers, and there’s a slew of choices at this price point. The highly regarded Laconico-designed Gemini retails for $170 and features a contoured titanium handle, superlative flipper action with a ceramic ball bearing pivot, anodized blue hardware, and a 3.125” S35VN blade. Our review of the Gemini tells you all you need to know. There’s also the unique Sheepdog designed by Chris Conaway, with its chunky handle with “vents” and a broad, high flat ground Sheepsfoot blade in S35VN for about $200 retail. The Vagnino designed Velox 2 is a slim, minimalist carry with a 3.375” S35VN drop point blade also for about $200. There are literally a pile of comparable Kizers in the same price and size range, almost all using titanium handles and S35VN steel – the Degnan Guru, the Vagnino Eliminator 2, the Lancer 2, and many more. You’re spoiled for choice. Zero Tolerance knives tend to be a bit larger than the Absolute, but in the last few years they’ve come around to making some more manageable sized knives. The Les George designed 0900 has a stubby 2.75” blade in stonewashed S35VN and a chunky titanium handle. It’s a bearing pivot flipper as well, and comes in at about $190 retail. There’s also the slim Dmitry Sinkevich designed 0450 flipper with a 3.25” S35VN blade for about $160. Finally, the minimalistic Todd Rexford designed 0808 folder comes in at an even $200 retail, with a 3.25” high flat ground drop point blade in S35VN. Like the others it flips on the super-smooth KVT bearing pivot and has beefy stonewashed titanium scales. Carry is right or left hand tip up. Spyderco has a couple of worthy offerings in this segment, too. The recently released Mantra 1 and Mantra 2 have been described by some as a Delica updated to modern standards, and the profile of the classic Delica 4 can be seen in the lines of both. Interestingly, they both have the same handle (a stonewashed titanium framelock) and different blades: the Mantra 1 has a 3.16” traditional full flat ground drop point blade with a thumb hole opener, while the Mantra 2 has a very narrow 3.2” filet shaped drop point blade that doesn’t protrude from the profile of the handle when closed for a narrow pocket carry. It forgoes a usable thumb hole, but drops 0.2 ounces versus the Mantra 1 at a scant 2.8oz. Blade steel on the Mantra is CPM-M4, which holds an edge like crazy and isn’t bad to re-sharpen but is prone to corrosion, so care is needed. Both flip on bearings and include Spyderco’s slick deep carry wire clip, and both cost the same at around $170 retail, lining up almost perfectly both in size, price, and materials with the Factor. 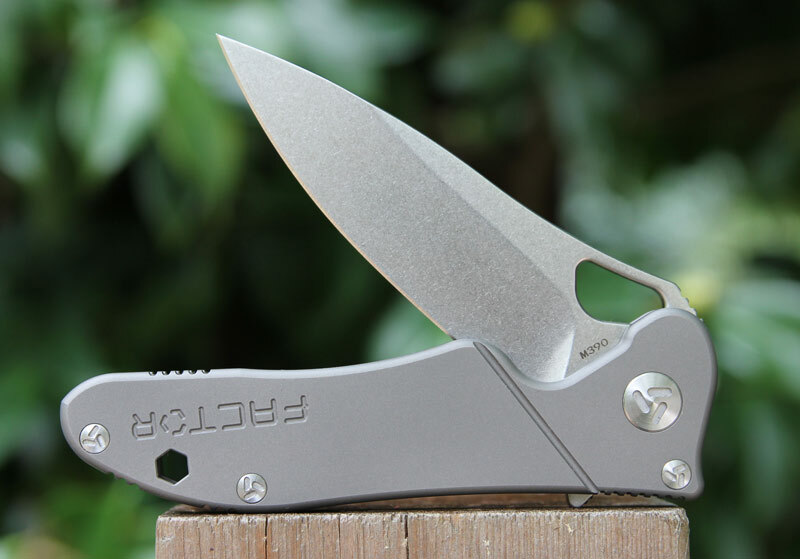 There’s also the Brad Southard designed Positron which has gotten mixed reviews, but still seems a compelling buy with contoured carbon fiber scales, a 3.00” full flat ground drop point blade, and a ball bearing pivot. The deep carry wire clip makes an appearance here too, and the Positron rings in at around $170 retail. If you want something sleek and slim, the full sized Boker Kwaiken in Titanium is only $140 retail – but the steel is a downgrade, VG-10 not being bottom of the barrel but the goal posts have moved a ways away in 2017. It’s still a charming knife, the 3.5” blade disappearing entirely into the handle when closed and popping open on IKBS bearings. 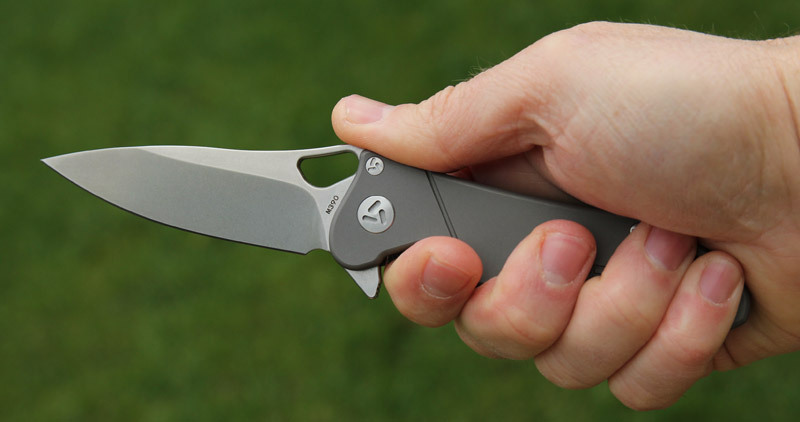 If you’re looking for a bit of small-maker excitement in this price range, the Brous Blades Insight (a Dustin Turpin Design) brings midtech uniqueness and angular lines to your pocket for about $210. D2 tool steel seems a bit old fashioned but it certainly works, and the titanium handle and Brous’ famous snappy flipping action make a compelling alternative. All of Brous’ knives are limited production so snapping one up may be a challenge, like it was with the Bionic flipper- a cool knife if you can actually find one, with a hollow ground modified wharncliffe blade and a funky handle shape. What do all of these have in common? Well, the Factor Absolute retails for about $190 on BladeHQ, and all of the similarly priced blades are using much less impressive steels at similar prices. Not that S35VN is slumming it, but M390 is absolutely towards the top of the heap. In fact, if you sort all of the knives at Blade HQ and filter by “M390 steel” and “titanium handle,” the Factor Absolute and Absolute Compact are the least expensive by at least $25 out of 190 knives. It’s a strong value proposition. The Factor Absolute has a lot of what I look for in a “first effort” knife – they swung for the fences. It’s not all hits but it’s not a bad knife by any stretch, and I enjoy using it even if there are some things I don’t like. You’re never going to get it all right on your first try. They got the basics right, though: start with the best materials, make it practical and usable. Make it cut well, make it look good, and make it a good value for the money to get your foot in the door. Note to Factor: if you want to make knives people use, don’t make them with proprietary hardware, please. Back off the detent strength, smooth out the bearings, go with a bent clip and you’d be approaching EDC greatness. It’s got good bones, just needs some tweaking in the details department. That the Absolute is a decent knife is perhaps less relevant than how Factor handled the intellectual property issue with the Iconic/Giant Mouse problem. As the market slowly turns to acceptance of Chinese products, it’s important for those companies to retain their integrity and make products that consumers trust, and respecting IP is, frankly, a large part of that. Is the Iconic literally a knockoff carbon copy of the GM1? No, but the design was similar enough to raise several rows of eyebrows. It’s reassuring to know that Factor took that issue very seriously and dealt with it accordingly. The last thing they want is a black mark among the enthusiast community during the early stages of their growth. They could disappear, or they could be the next Kizer or Reate – the quality is certainly up there, as most of my issues are related to design rather than assembly. Where does the brand go from here? According to Factor, “the Factor Equipment brand will evolve more toward an affordable, high quality knife brand over the next year as we have 10 additional styles in current production and more in design to also release before year end” – meaning the Absolute and knives with similar materials will likely form the upper end of their range with less expensive models forthcoming with production in either China or Taiwan. It will be interesting to see how the brand shapes up and how they go about marketing their products. And if their knives are well made, reliable and represent good value then they should do fine. While far from perfect, the Absolute is a decent early effort from new brand, Factor.